Pascale Hibon from Laboratoire d'Astrophysique de Marseille has been visiting our team. She is a student under the supervision of Jean-Gabriel Cuby and Chris Lidman. For her thesis she is trying to find very distant Ly-alpha emitters, at redshift z~8. The detection of these faint objects is made trough the narrow-band technique, in the near infrared in this case, using ISAAC at the VLT and WIRCAM at the CFHT. One of the main goals of her work is constrain the neutral fraction of the IGM during this epoch, through the Ly-alpha luminosity function. Jesús Gallego and Pablo G. Pérez González are observing with VLT (UT1: ANTU) 8.2m telescope of ESO Cerro Paranal Observatory at Chile. ... Tan lejos como para llegar a participar como co-investigador principal en varios instrumentos astronómicos del que será el telescopio astronómico más grande del mundo. Se llama GTC, o lo que es lo mismo, Gran Telescopio de Canarias. Ubicado en el Observatorio del Roque de los Muchachos, en la isla de La Palma, y perteneciente a España, México y la Universidad de Florida, este instrumento presume de tener, nada más y nada menos, que el equivalente a un espejo de 10,4 metros de diámetro. 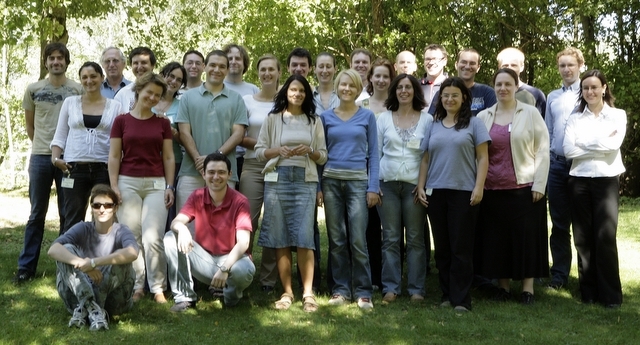 The Second NEON Archive Observing School at ESO hosted 20 students from 13 different European countries. The lecture program featured talks ranging from an introduction to spectroscopy and photometry to detailed presentations on future observatories such as ALMA. The main focus, however, is on the research projects the students carry out in groups of four under the supervision of an experienced astronomer. Two students of our group attended the course Juan Carlos Muñoz and Guillermo Barro. The UCM Summer School: La Instrumentación Astronómica y el Futuro de la Astrofísica joined students and teachers in El Escorial (Spain) from july 31st to august 4th. The course was organized by Jesús Gallego and Jaime Zamorano. Carlos Andradas, Xavier Barcons, Nicolás Cardiel, Marisa García Vargas, Rafael Guzmán, Steve Eikenberry, Jesús Martín Pintado, Miguel Mas-Hesse, Benjamín Montesinos, José Miguel Rodríguez Espinosa, Rafael Rodrigo and Enrique Solano were the teachers. The picture shows Carlos Berzoza (highest academic authority: UCM Rector) with some of the students and teachers.